Escaping to sunny Cabo during cold winter months is always a good idea, but often travel can take a toll on our skin. Unlike other popular winter destinations that are tropical, Cabo San Lucas has a desert climate resulting in very sunny skies and very dry air. If you are visiting Cabo from a colder climate your skin may experience discomfort from the acclimatization. By the time you land at Cabo San Lucas Airport, your skin will already be experiencing the so-called “airplane effect”. Cabin air can cause dry, flaky, or red skin. Typically, skin is most comfortable when the humidity is between 40 to 70 percent. Airplane cabins average about 20 percent humidity. While you are at a cruising altitude, the aircraft cabin tends to be pressurized between 6,000 to 8,000 feet, which is the equivalent to what you might feel if you were standing on top of a mountain. The higher the altitude, the less blood flow to the skin, which may make for a dull appearance. When your skin dries out, it may overcompensate for the dryness, which means one thing: grease. Increased oil production is just your skin’s way of trying to counteract the super dry air in the cabin. Make sure you drink lots (and lots) of water and use moisturizers that contain hyaluronic acid and skip the facial mist even though it may feel refreshing. As the water evaporates from your skin, it can just make dryness worse. To counteract the effects of the airplane and get that vacation glow right away, look for HydraFacial – a treatment that guarantees a lustrous complexion, also known as “Red Carpet Facial” at your resort. 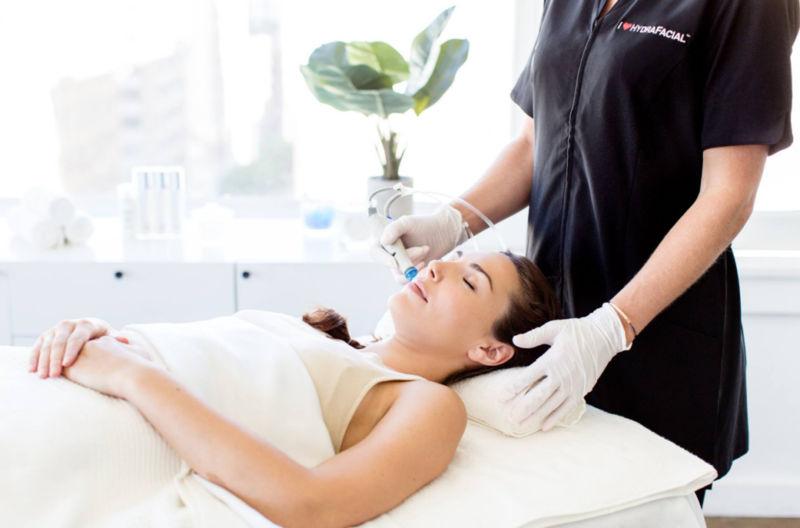 HydraFacial is a medical grade treatment focused on cleansing, exfoliation, extractions and hydration with no downtime. You will see instant and long-lasting results, with no recovery time needed. Any skin concerns such as dehydration, fine lines, acne and hyper pigmentation can be addressed with a HydraFacial treatment. Lymphatic drainage is done to increase circulation of the lymphatic system. This increases blood flow, brings oxygen to support the cells, restores hydration and eliminates toxins. Dead skin cells are gently exfoliated to reveal healthy, new skin. Botanical extracts are delivered deeply to cleanse and nourish the skin. A gentle glycolic and salicylic solution is used to loosen debris from your pores while brightening the appearance of the skin. Extractions help to remove blackheads and draw out impurities in congested areas using a serum of natural salicylic acid and honey extract. The HydraFacial treatment delivers a cocktail of hydrating hyaluronic acid and the most advanced and powerful antioxidants, peptides and multi-peptides to replenish the skin, leaving it hydrated, plumped up and at optimum skin health. Red and infrared LED light is used to stimulate collagen and stimulate natural production of vitamin D, leaving your skin glowing. The thing that sets HydraFacial apart from average facial treatments is the fact that the skin looks clearer, smoother and glowing immediately afterwards without any side effects. In fact, it not only improves the appearance of facial skin, it leaves the skin looking healthy and rejuvenated. One of the few Cabo San Lucas spas that offer HydraFacial treatments is the Spa at Diamante Cabo San Lucas. The Spa at Diamante perfectly complements its members’ active, outdoor-oriented approach to health and well being. The expert staff provides comforting treatments that include a wide range of massages, body treatments, facials, manicures and pedicures. The Spa combines the finest, most effective spa products available on the market.